Tucked away in the district of West Bay is a small shaded beach area I like to use with groups. I have memories of swimming on this beach with my grandmother when I was a little girl, in those days there was an abattoir there and we used to go and buy green sea-turtle and go back to her house and cook it on a caboose. Just walking on this old sand road makes me happy. 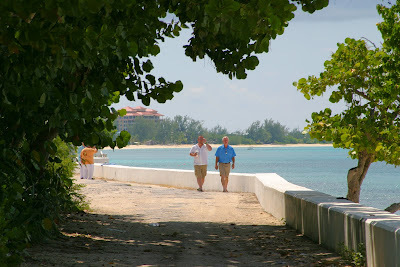 The men in the group walked to the wedding location from the West Bay office of Cayman Weddings where the bride was getting dressed with her mother and sister in attendance. The traditional linking of arms and sharing the first drink together as husband and wife. This 8" cake with fondant icing and fresh dendrobium orchids is perfect for a beach wedding where there is a small group of guests. Feeding each other something sweet, the first food eaten as husband and wife is supposed to "sweeten" your life together. 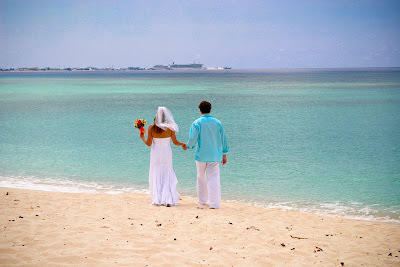 Simply Weddings arranges cruise ship weddings on the beautiful beaches of Grand Cayman every week of the year. 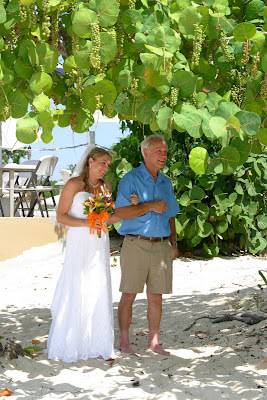 We are your cruise wedding specialists, conveniently located less than a mile from the Rayal Watler cruise landing. Our Bridal Room is available for you and your friends to dress. 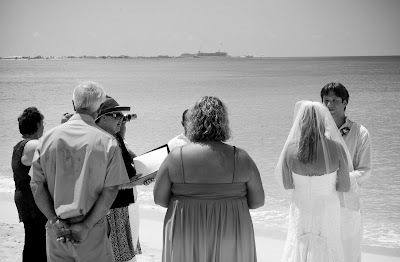 Call today to book our value-added All Inclusive Cruise Wedding package +1 (345) 9499933. 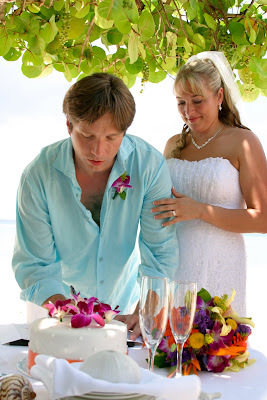 Ceremony by Joy for Simply Weddings, photos by Mari for Island Photo, flowers by Trisha's Roses.